Oh happy day. 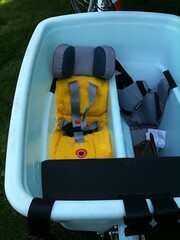 This Saturday I cobbled together a simply kludgetastic infant seat for our MADSEN cargo bike. We then proceeded to ride around with it ALL WEEKEND LONG. Because my baby on bike fantasy has come true. OK, yes, due caution is advised, please read our baby on a bicycle article, etc etc etc ... but this setup is the beez kneez! I would post detailed instructions a la Instructables, but that would 1) expose me to more liability than I would like 2) reveal entirely too much about my, um, "process" ... let's just say that a tomato knife got involved when I couldn't find my hacksaw. And brute force ripping. And the use of a long wood bolt and piece of used deck when the hex bolt I had wasn't long enough. Basically, I sawed the sides and top lip off of the infant car seat so that it fit rear-facing down in the bucket, and ripped the side panels off the seat cover, trimming the cushion foam to fit. I then cut pieces of foam board to fill in space and support the car seat underneath, since chopping up the seat leaves it quite noodly. I left a smidge of room underneath so the straps could be adjusted, which also gave the seat a bit of "suspension" - bonus. I bolted the top of the seat through the front of the bucket, sent a long bolt from the bottom of the seat bucket through the foam and out the bottom as well, and used zipties to cinch the front lip of the car seat to one of the rear belt brackets to tighten things up. The head protector from the Chariot accessory was then bolted to the top of the infant seat, and we added a sun shade as well. The whole project took about 2-3 hours. And another 2-3 hours in the doghouse for use of the tomato knife. very stable head/neck positioning and protection - no bobble-head! Now I just need to devise some protection from the sister ... but Luc loves it. Or at least tolerates it with less fussing than in the car. It's snug and cozy and he falls asleep most times we ride (if so, I just pull the bike into the backyard and let him finish his nap there). The jostling is minimal, even over bumps - he's as low as possible, suspended a bit, and not over the axle the way he was in the trailer. The hi-tensile steel longtail design of the Madsen adds "cush", as do the balloon tires we added. If we tip, he seems well-protected, certainly more so than in a jogging stroller. And I so much prefer having both kids on the bike than towing the trailer. Gliding through quiet neighborhood streets with Luc and Drew aboard where I can talk to them is simply magical. We rode to the fireworks and back, and then yesterday I took them to the Greenlake wading pool going over Phinney Ridge both ways. Rarrrh! Pushing bike + trailer up that hill would have been less enjoyable. Looks good! 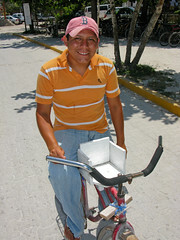 Not nearly as "kludgetastic" as this one I ran across in Mexico. Yeah, BikeJuju, but sadly, that guy's woodworking skills far surpass my own. Hence the car seat vs tomato knife approach. Love it, looks like a great solution! Happy summer riding. Excellent work. My three are out of the infant stage but like your solution A LOT. As the Yuba gets slowly assembled in the living room, I keep coming back to look at your design. I'm contemplating a sturdy box (plywood? fiberglass?) on one of the side racks, with a similarly-hacked car seat snuggled inside. So glad I've got months to figure it out!! Fantastic! I wish all of this had been available for my kids when they were younger. I had a standard rear seat that topped out at 25 lbs. I Love it ! It makes it all the better knowing that a tomato knife was used to create it. Do you have (from the bottom) foam, carseat, chariot part, then baby? Yup, that's the ticket. Send pix! Looks great! 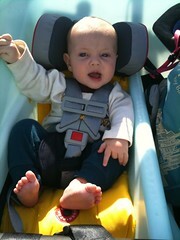 My situation is that my not-so-little 11-month-old LOVES to ride on the Madsen. He hangs over the side and waves and talks and grabs. Then falls asleep half way up a mile-long incline. I've taken to carrying blankets and pillows in addition to my daddy diaper bag so that he and his 3 y.o. sister can lay down in the bucket when the get sleepy. Takes up ALL the cargo room, but what's the room for if not the kids? Thank you for this post! I have a 4 month old and have been struggling to find biking solutions since before he was born. It's amazing... the resistance and "can't do" attitude I have encountered in my research. After reading your post I was convinced that a Madsen is for us, since the "solution" so far is for me never to go anywhere with the baby if I'm on bike, or that I can't go anywhere on bike if I have the baby. This is no solution. In my lobby for getting the Madsen, I pointed out that even if I wait a whole year and Dexter (that's the baby) is alright to ride in one of those hideous tow trailers, what if I have another baby? Then I have to have a hiatus from riding for yet another year? Ridiculous. So thank you for your Madsen DIY and kid transport insights. Pregnancy and having children is not a disease! And it's good to know there are other parents out there who don't think their babies need to be sequestered behind 4 doors all the time. Hi Olena - Dr and Mrs. Mekon have both bikes, and a preliminary comparison up. And the Wittwer clan started with a bakfiets and are now in a MADSEN. Follow his Twitter feed for updates; a detailed comparison is forthcoming. Good luck! I've rented/borrowed a bakfiets several times, and prefer it for shorter, flatter trips, as I just love having the kids in front. For hillier terrains or tighter budgets, the Madsen may be preferable. I came across your blog today while searching for family biking options on google. Love what I've read so far, especially this post about a possible option for babies... Do you have any place with additional pictures of both kids in the Madsen? I am having trouble visualizing how it would work? We have one 7 month old and intend to have another down the line so they will be around 2 years apart. I'd love to try and plan ahead to what could work for biking solutions. We try to walk/bike almost everywhere in the town we live in, and that has been more complicated now that we have a little one. I don't even know where to begin looking for solutions, but this blog has been a great start! HI Wendy! Check out our Flickr photos for lots of MADSEN variations, especially our 3yo and 1yo. Well, that's a very new concept. Bringing kids with you seems like a less burden when you are creative. I don't understand why a company can't make one of these or something that is great for 3 months+ that is under $1000. Does anyone know of anything that I can buy? I'm not too crafty, as this author must be!